While bathrooms provide an important functional role in the home, they can still be beautiful. Design blogs and social media accounts are full of pristine bathrooms, which can range from spacious and spa-like to tiny powder rooms that pack a punch. No matter the size and layout of your bathroom, choosing the right paint color can be difficult, but it doesn’t have to be. Just follow these tips to choose the best paint color for your bathroom. Each of these considerations may lead you in one direction or another when choosing a bathroom paint color. For example, larger bathrooms tend to look airier and more spacious when painted lighter colors. Powder rooms, though small, can be a fun place to try a bold or bright color, nearly risk-free. Or, if you only have room in the budget to paint, but not switch out current fixtures, you will want to coordinate your paint color with the existing fixtures. Here are some of the best ways to choose paint colors for bathrooms of every size, shape and function. Large bathrooms look amazing in white, which provides a feeling of even more spaciousness. Paint a cool white with blue or grey undertones for a crisp, clean look, or a warm white with yellow or gold undertones for a cozy feel. If your bathroom has mostly white fixtures (cabinets, sink, doors, trim), consider painting a bolder color on the wall. The lighter accents will help to balance all that colorful wall space. Try darker greys, energetic greens or moody blues. Want the best of both worlds? Some large bathrooms can handle an accent wall. The classic small bathroom paint color is a bright, clean white, especially if it’s the only bathroom in the house. It will keep the space looking tidy and open. Avoid warmer whites, which can look dingy or sallow in small spaces. 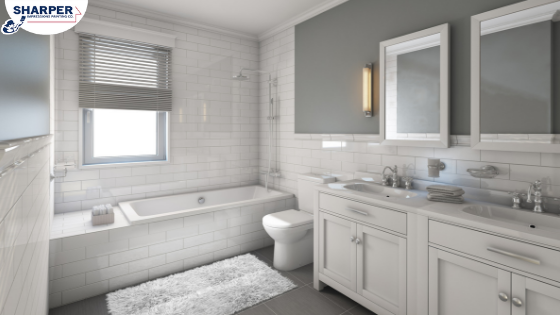 Light greys work well in small bathroom spaces, especially with white fixtures, which will pop against the color. For the homeowner with bold tastes, dark, inky colors can totally transform a small bathroom and make the walls feel like they disappear into the background. Classic colors like navy or charcoal can also bring in a cozy feel, especially when paired with richly textured towels, baskets and accessories. One hot trend is to paint the walls and the ceilings the same color so a smaller bath has a bigger feel. Half baths and powder rooms are a great place to take risks! Try that color that’s always intrigued you, like eggplant, teal or even black. The smaller the space, the bolder you can go with color. Since there is limited wall space, a deep jewel tone won’t overwhelm the eye like it would in a large bathroom. Tiny half baths and powder rooms are a fun place to go monochromatic. Match paint to fixtures to give a chic, cohesive look. Since bathroom cabinets typically aren’t at eye level, stronger accent colors can work to bring a pop of color into the space without taking over the room. Keep it classic by painting cabinets a shade or two darker than your wall color. Dark greys and dusty blues can give dated cabinets a facelift and help them blend into your décor. When painted properly, painted cabinets will last many years and cost 1/16 the cost of replacing them with new ones. If you don’t want to switch out your old tile, let your wall color work for you. The tile will be less noticeable if you choose a more modern color in the same family. If you love the vintage fixtures in your bathroom and want to make them stand out, clean whites and light greys help darker fixtures stand out, while deeper colors can make that old penny tile take center stage again. Still can’t decide? Go ahead and embrace a vintage look and “update” your bathroom to look as fresh as it did the decade it last had a little love. Research popular color palettes from that era and find softer, updated alternatives. If you’re still stumped on bathroom paint color, an expert paint color consultant can help you decide what would work best in your space. Plus, with all those bathroom nooks and crannies, it can save you hours (and mistakes!) when you hire professional painters. Reputable interior painters will offer free estimates and provide direction on color. Get your free bathroom painting quote today!